I know I just made a post about how I generally avoid recipes that have a page worth of ingredients, but it doesn’t count if half the ingredients are things I keep in my house. Right? Yah, that sounds like an excuse to me too. Anywho, I really like Asian food, I mean what’s not to like. It’s hot, spicy (not always the same thing), it’s always served with either rice or noodles, and generally not the worst thing you could eat health wise. But notice I do say generally. This is because a lot of times really good Chinese food is fried. I do so love my fried foods. It’s a shame I don’t have the metabolism of a high schooler any more and can’t just eat fried foods all day. Plus they tell me it’s bad for me, something about clogged arteries and heart attacks. To bad. I’ve wanted to try to make homemade Chinese takeout for awhile, but the way of getting crispy chicken without deep frying it was eluding me. It all comes down to how you coat or bread the chicken. 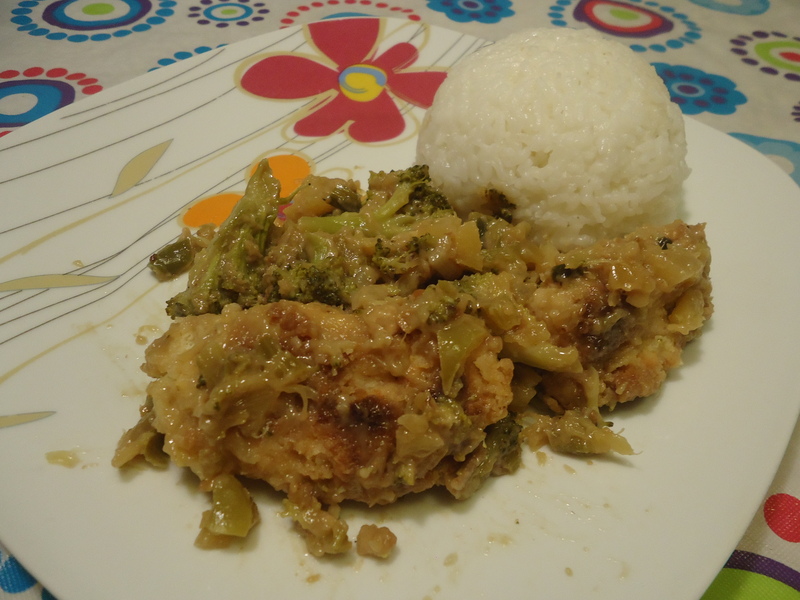 I got this idea for coating the chicken from here http://stuffcynloves.com/2013/05/03/best-general-tao-chicken-recipe/. It works really well as a pho-fried food breading. 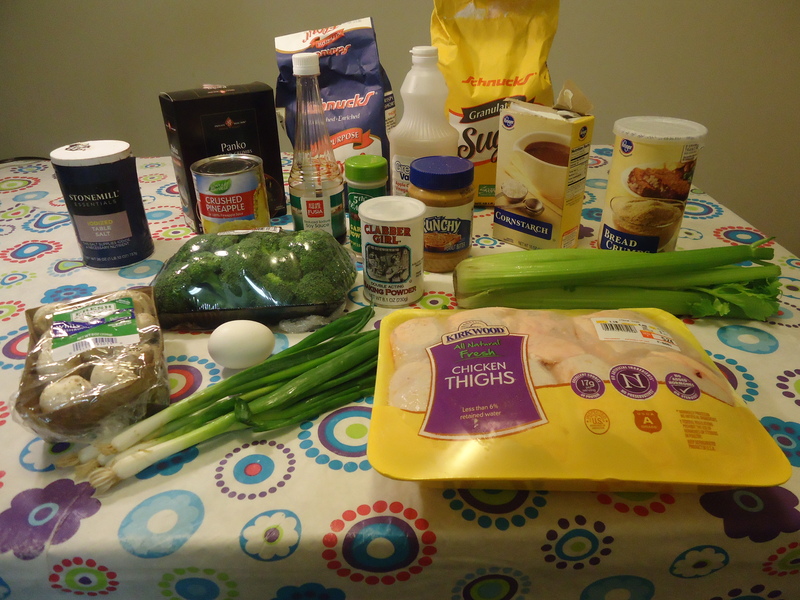 If you’re working with chicken thighs, deskin and debone, and try to cut off any large chunks of fat. For either chicken thighs or breasts, cut into approximately 1 inch pieces. Set up a line of three bowls. In the first bowl, pour 1 cup of cornstarch. In the next bowl mix together the 2 eggs, salt, baking powder, and flour which will make a thick goo. In the last bowl pour the 1 cup of panko. You can use breadcrumbs instead of panko, but the chicken won’t be quite as cruncy. 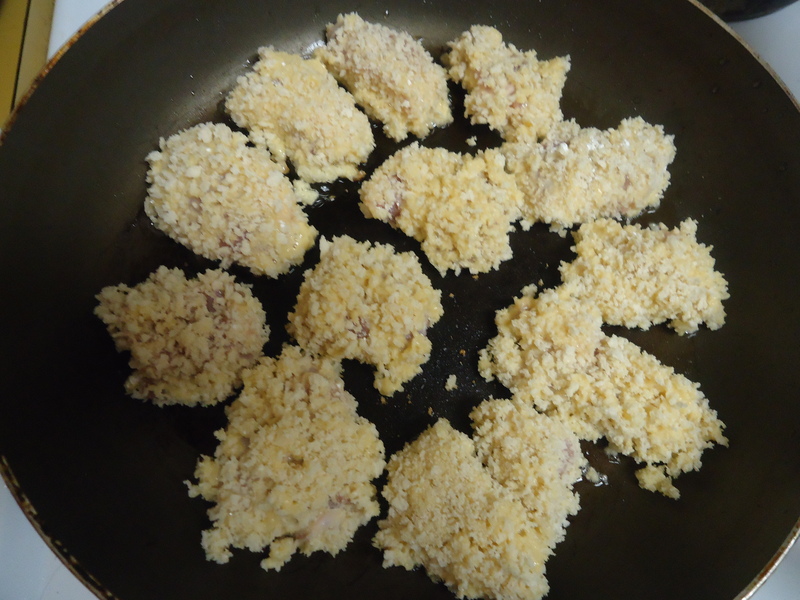 Dip each piece of chicken into first the cornstarch, then the egg mix, and finally the panko. Try to shake off any extra cornstarch before coating your pieces with the egg mixture. Put just enough oil in a deep skillet to cover the bottom and heat under medium to high heat. After the oil is hot, put in the chicken pieces, evenly spaced and so they don’t quite touch. Cook until panko starts to brown and then turn and cook on the other side. Make sure the chicken is cooked through and remove it from the pan, takes about 10-15 minutes. While the chicken is cooking finely chop all your veggies and put in a big bowl, it’s a lot of veggies. In a small mixing bowl add the peanut butter and 4 tablespoons of soy sauce. Mix a little, until the peanut butter is not a blob in a sea of soy sauce but it’s not going to make a smooth mixture. Pour the mixture onto the veggies and mix well. 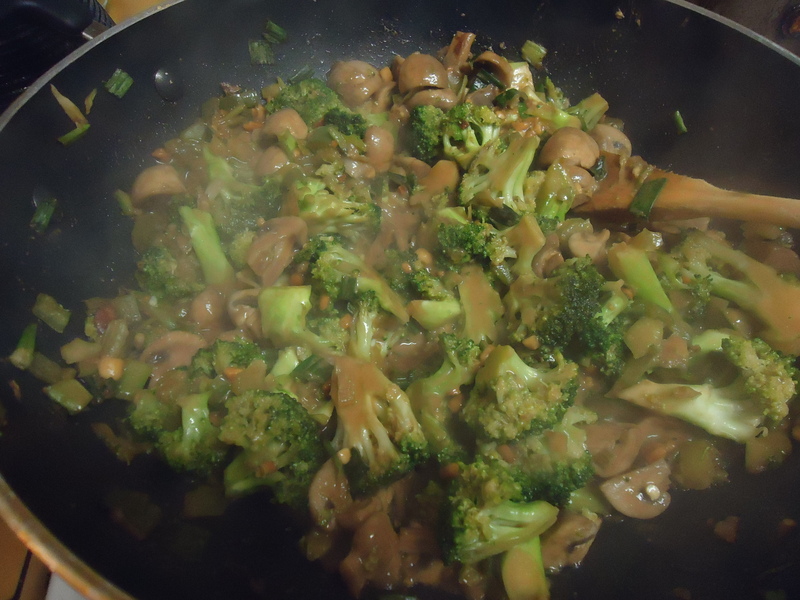 Pour the veggie mix into the skillet and cook on medium to high heat stirring often until the veggies soften. Takes about 10 minutes. While cooking the veggies mix in a suacpan the pineapple, sugar, apple cider vinegar, remaining soy cauce, cornstarch, and garlic powder. Mix in each ingredient one at a time beginning with the pineapple and mix well after every addition. Cook under low heat until everything is well incorporated, you’re difficult ingredient here will be the cornstarch. This really only takes 5 minutes or so. After the veggies are soft turn heat down to low and add back in the chicken. 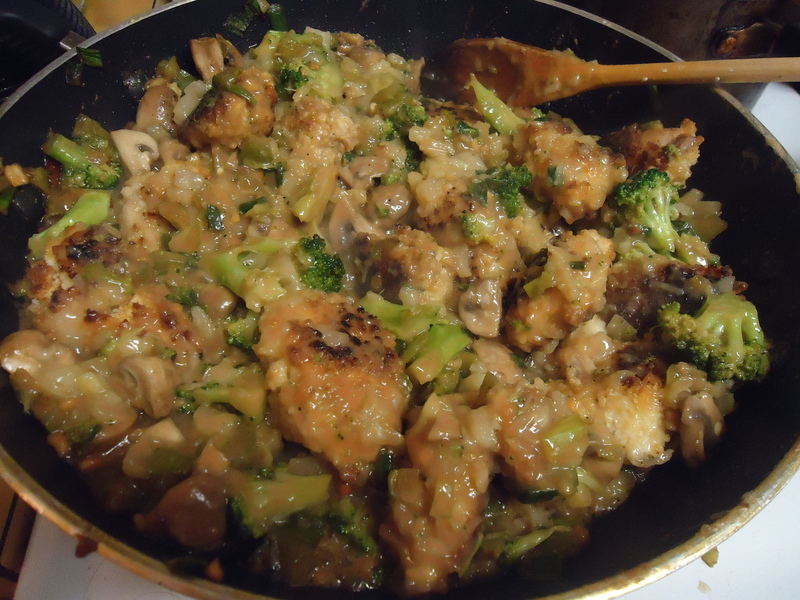 Stir once or twice until the chicken is evenly mixed. Add the pineapple sauce to the skillet and mix well. Cook for another 5 minutes or so and you’re done. Serve with either rice or butter noodles. If you’re a fan of broth with your rice, double the sauce mixture. Really this is a pretty easy recipe, but it does take some time. Around 45 minutes to an hour start to finish. I’m personally a big fan of salad. I feel that a lot of times salads get a bad name as being smothered in dressing, or having everything in them but the kitchen sink. But they can’t be all bad. My mom actually makes that second kind of salad and it’s amazing. She makes the dressing from scratch and everything, but when I finally got her to give me the recipe for it, it seemed to be a mile long. While I know that it would not be complicated to make, I generally balk at the idea of making something that has more than 20 ingredients. I’m also not a huge fan of lettuce. Since lettuce is the principle ingredient in most salads, and it has no taste, I suppose those other 19 ingredients are necessary to make the lettuce taste like something other than crisp green water. And depending on how long your salad has been out of the refrigerator, you even loose the crisp. So I’m going to say this is not so much of a recipe, as an idea, inspired by something similar I found in a cookbook. Why not take the lettuce out of the salad? And while I was at it I figured I could add some bread too. Bread improves every meal, and I’m an even bigger fan of sandwiches than I am of salads. 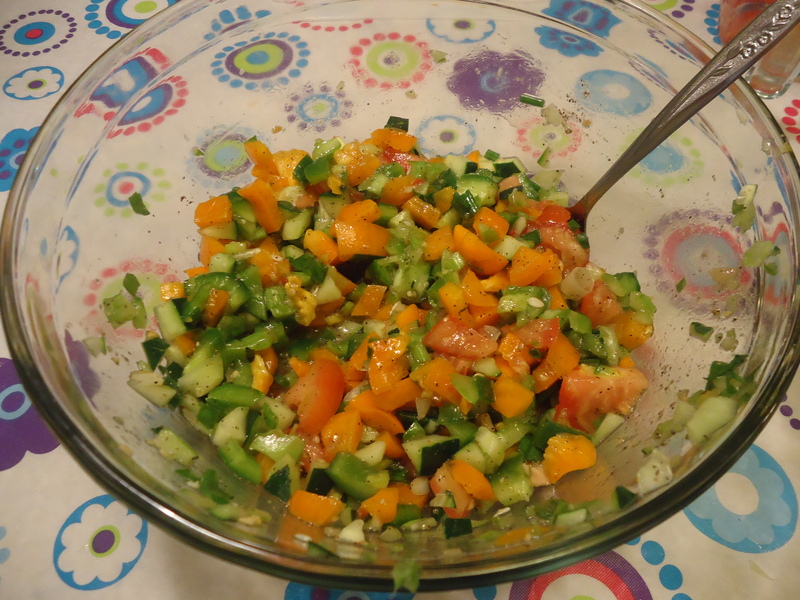 Finely chop all the vegetables. Mix well with the black pepper and Italian Salad Dressing. I feel you could almost use any veggies you wanted in this, my only caution would be to try to keep it from getting too wet, as that will dilute the Italian Salad Dressing which is providing most of the seasoning. 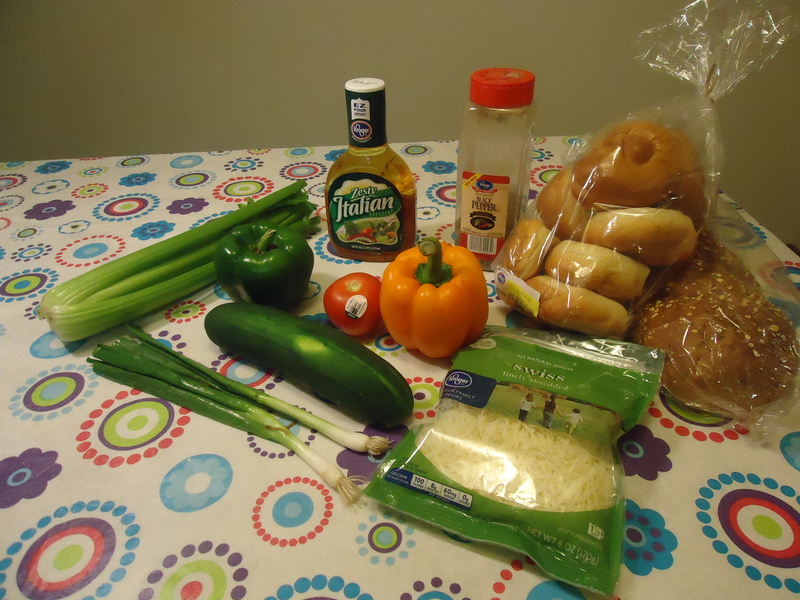 Just as you can use almost any veggies, you can use almost any bread. If necessary, cut the bread in half. 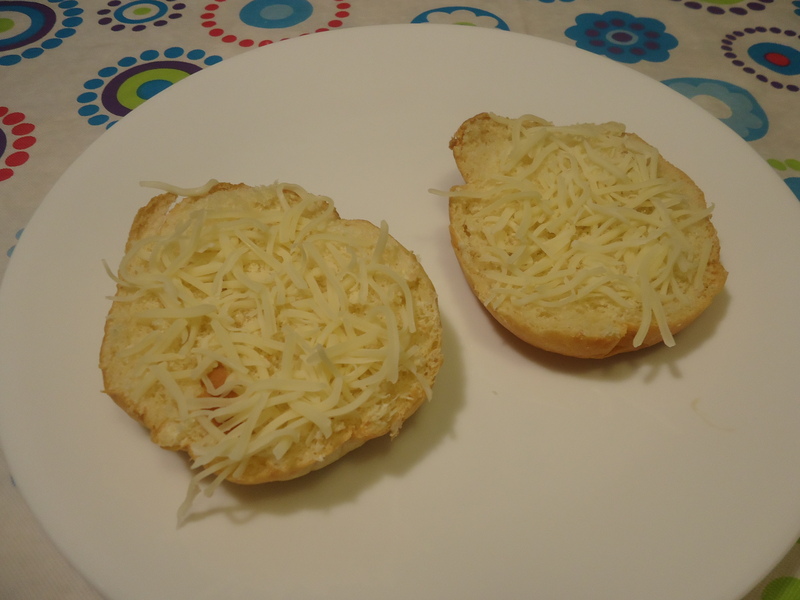 On each half, or slice, sprinkle enough of the Swiss cheese to just cover the bread. Cover the bread with a paper towel and microwave for 1 minute. This will melt the cheese without drying it out or burning it. 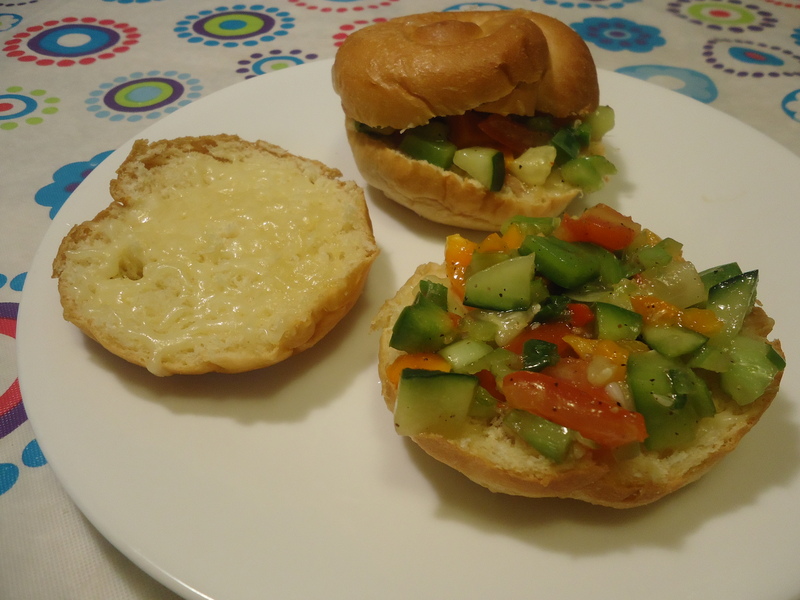 Spread about 1-2 tablespoons of the veggie mixture onto one half of the sandwich and place the other half on top. Makes 4-8 sandwiches depending on the size of the sandwich.